When it comes to wedding season it can be easy to head straight for the Little Floral Dress as the go-to outfit but with so much choice on offer it would be a shame not to broaden your style horizons and try something a little different. As a Personal Stylist this is a busy time with women calling upon my services for all their occasionwear needs but what for many years has been a sea of floral frocks is now much more varied with updated options to suit every age, shape and size. If you think outside the sartorial box with these alternative yet flattering, fun and fresh wedding guest outfit ideas, not only will you be less likely to find yourself next to someone on the dance floor in the same dress but you’ll look and feel great, without stealing the bride’s thunder, of course. The ease of dresses is that they eliminate the need for too much thought; so it’s no wonder they are the number one choice for wedding guest outfits but the dress isn’t your only option when it comes to one-piece winners. Jumpsuits are everywhere and there’s a shape to suit every woman so find yours and treat it exactly as you would a dress and you’re good to go. Chalky pastel tones and ruffles sound just right for a wedding but to make it less Bridesmaid and more Stylish Guest I opted for this one-shoulder jumpsuit. With key trend details combined with a soft lilac hue, this jumpsuit was just made for attending a wedding. Style tip: Complete the look with a navy or black bag to punctuate the outfit and add a little edge; choosing a patent finish adds interest to the look with contrasting textures from the soft suede to mock croc leather. 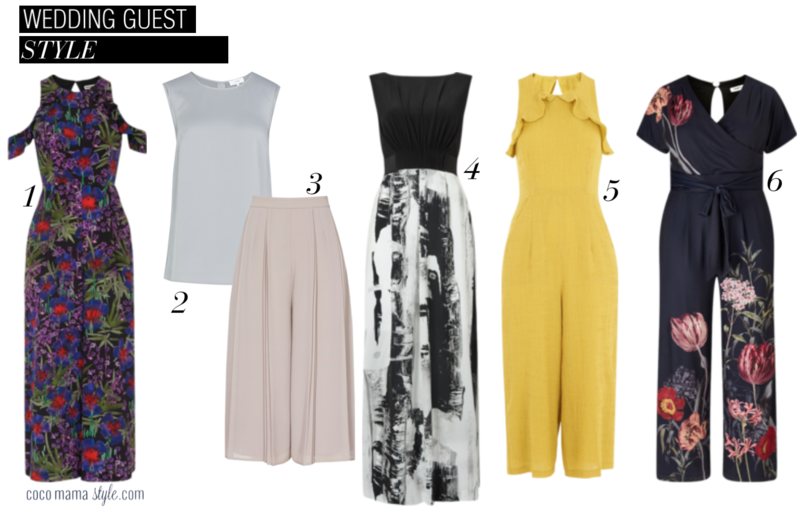 We’re spoilt for choice when it comes to special occasion outfit ideas whether you’re a wedding guest or an adult bridesmaid looking for something a little different yet still appropriate. If budget is a key consideration with your outfit then separates which can be worn in other ways and dressed up or down depending on the occasion are ideal for getting the most for your money and making a positive addition to your wardrobe. But don’t think you are limited to tops and skirts for wedding-appropriate style, for there is a new separate on the occasion wear scene and it’s The Culotte. Style tip: Try a bold colour or bright print wide-leg crop trouser and team with a tucked in top, perhaps a bright silk vest, off the shoulder top or lace trimmed camisole topped with a light-toned blazer to smarten up. Another take on separates is the ‘co-ord’ as co-ordinated outfits have been given an update in recent years – and don’t worry, I’m not talking matchy-matchy his ‘n’ hers looks – with prints in sync across jacket and trousers or top and skirt looks. The great thing about matching separates is that you don’t have to think about what to wear together and you get the overall polished look that feels special for a wedding, with the ability to accommodate different sizes on the top and bottom. Style tip: A two-piece suit needn’t just be for men so choose a bright colour or print for a feminine twist on this masculine ensemble. If you’re not a fan of your legs or want to try something a little different, take the full length and fabulous route to wedding guest attire. If you can’t bear to part from florals for the special occasion, this is a way to update your trusty print dress for 2017. Style tip: Long-sleeved maxis are also a winner if you’d rather keep your arms covered and they’re having a real fashion moment right now, plus you can wear flat sandals for all-day comfort. In collaboration with John Lewis. 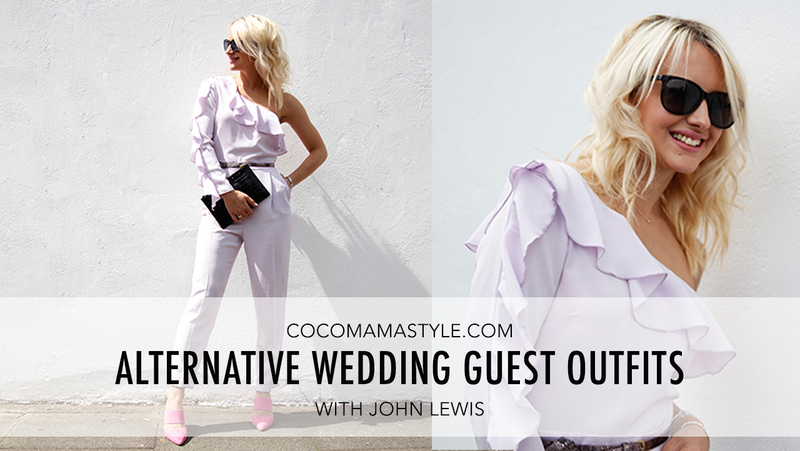 I’ve become quite the Instagram fan of yours, and today, at a wedding whilst travelling between Venues I had a quick read of your blog and was DELIGHTED to be wearing a jumpsuit- I was bang on trend for once! I’m super proud of my outfit and made my husband take a ‘cocomamanstyle’ posed photo that id love to send you, if possible?